War, paradoxically, has tended to bring prosperity to Newfoundland and Labrador, and never was this more obvious than in the Second World War. The economic boom that accompanied the construction of Canadian and U.S. bases gave many Newfoundlanders jobs that paid well in cash for the first time, helped to pull Newfoundland's economy out of the Depression, and contributed to post-war industrial development. The construction and clerical jobs that accompanied the bases and opportunities to join the armed forces led to very high employment rates. Spin-off industries such as transportation benefited as well, as the Newfoundland Railway realized one of its rare profitable periods and air travel became more common. These positive changes pale in comparison to the human and economic cost of the Second World War that was paid both overseas and on the home front. Nevertheless, the people and government of Newfoundland struggled with health challenges such as housing and venereal disease that would not have occurred or would have been less severe had war not created new social and economic problems. Economic growth did bring positive changes, however, and base hospitals built during the war became important parts of health care infrastructure when hostilities ended. The "friendly invasion" of Newfoundland and Labrador by American and Canadian armed forces during the Second World War was dominated by the construction of army, navy and air force bases in St. John's, Gander, Argentia, Stephenville, and Goose Bay. In addition, dozens of small artillery and observation posts were scattered around the coastline. These bases required civilian workers, and hundreds of people traveled to them looking for employment, much needed after the Depression years. But base areas were not always able to handle the increased numbers of people. In St. John's, for example, which had long had a housing shortage, many soldiers had to be billeted in the town until barracks could be built. People coming in search of work put even more strain on limited rental accommodations. Many houses were overcrowded and poorly maintained, and living in damp, cold houses in close contact with others made it easy to spread diseases such as tuberculosis. Furthermore, many houses lacked sanitation facilities, which led to poor hygiene and increased incidence of disease. In Stephenville, Harmon Field expanded several times throughout the war, and was under construction constantly. Many residents were displaced from their land by the base (sometimes repeatedly), and often turned from farming to business to make ends meet. Small shops and services sprang up quickly to supply the base's vast needs, and people flocked to the region in search of work. As a result, shanty towns quickly grew up around the base perimeter. Believing that they would be torn down if and when the base expanded, occupants of these slums did not bother to improve their properties. Sanitation facilities were virtually non-existent, and wells supplying water were often contaminated by sewage. In 1943 the U.S. Army prohibited its soldiers from using facilities such as cafes and barber shops that were using contaminated water, and the Newfoundland Government sent a sanitary inspector to Stephenville to assess the problem. Despite these efforts to remove the slums and improve health conditions, ineffective supervision and poor inspection of buildings in the area meant that shack towns persisted well after the war was over. The entire population of Argentia was relocated when the community was expropriated for the construction of the U.S. Naval Station. Even Argentia's graveyards was moved to a new home in nearby Freshwater. Gander and Goose Bay had little or no resident population before the construction of air bases, but their workers and servicemen often had to live in overcrowded temporary shelters until more permanent ones could be built. Both military populations and port cities such as St. John's often have problems with venereal disease (VD), and VD was a major concern of military health officials with the Canadian and American forces stationed in Newfoundland during World War II. United States officials commissioned a study of the health services in Newfoundland in 1940, and it was no surprise that one of the major health concerns addressed by the report was venereal disease (the other being tuberculosis). The report was largely critical of VD control, treatment, and prevention in Newfoundland, noting that the VD clinic was inadequate and that patients infected with syphilis or gonorrhea were often "regarded more as one who has a moral stigma than one infected with a communicable disease." It was also noted that these diseases were among the most common infectious diseases encountered in St. John's. Important for the soon-to-arrive military, the report concluded that there was no organized commercial prostitution in the city; however there were a "considerable number of young girls and women" who were prostitutes, taking clients to cheap rooming houses or public parks. Nonetheless, when American forces arrived aboard the Edmund B. Alexander shipboard physicians soon began to encounter cases of VD. This continued as Fort Pepperrell was constructed and U.S. forces moved in. In addition to receiving medical treatment, infected soldiers were pressured to identify the women they believed had infected them, so that they too could be treated to reduce further spread of the disease. The U.S. administration expressed considerable concern that Newfoundland women were infecting their soldiers, overlooking the fact that these women may have been getting the infections from visiting servicemen in the first place. At Fort Pepperrell, the infection rate was roughly 25 per 1,000 soldiers from 1941-43, dropping to 10 per 1,000 in 1944 when health authorities stepped up their preventative efforts. Despite concerns about the possibility of infection from local girls, VD rates at Fort Pepperrell stayed well below the U.S. Army's average of 49 per 1,000. VD was also a problem at Harmon Field in Stephenville. To control the spread of disease, U.S. officials treated infected women for free at the base hospital, forced infected soldiers to identify who they may have caught the disease from, and even managed to remove "notorious" or "delinquent" girls from the community by ostracizing them. Infection was thought by U. S. medical authorities to be rampant in local communities, leading them to ban servicemen from certain areas where they claimed the entire civilian population was infected. It is noticeable, however, that these areas were largely populated by descendents of Mi'kmaq Indians and French settlers, and these claims and concerns may well have been based on the racist attitudes of American authorities. One of the obvious needs generated by war is medical care for sick and injured servicemen, and hospital beds for long-term patients. The Royal Canadian Navy (RCN), for example, followed the general rule of having enough hospital space to accommodate 5 percent of land-based and 50 percent of ocean-going personnel at any one time. St. John's did not have enough hospital beds for its own population, let alone for the large numbers of servicemen. As a result, an unprecedented number of hospitals were constructed by military forces during the Second World War. The RCN built two large hospitals in St. John's, adjacent to the TB sanatorium on Topsail Road and the General Hospital on Forest Road. The Americans built large, modern hospitals at Fort Pepperrell in St. John's, and at Argentia and Stephenville. Other hospitals were built in Gander by the Royal Canadian Air Force (RCAF), and by the Canadian Army in Botwood to serve the seaplane base there. Goose Bay had two hospitals operated by the RCAF and the USAF. The hospital was built by the United States Air Force in World War II and operated by the United States North East Command (USNEC). Photographer unknown. Reproduced by the permission of the Maritime History Archive (PF-306.798), Memorial University of Newfoundland, St. John's, NL. These military hospitals were some of the most modern medical facilities in Newfoundland and Labrador. When the war ended, most of them were no longer needed by the military, and were put into civilian use. The TB sanatorium on Topsail Road, for example, nearly doubled in size when it absorbed the adjacent RCN hospital. 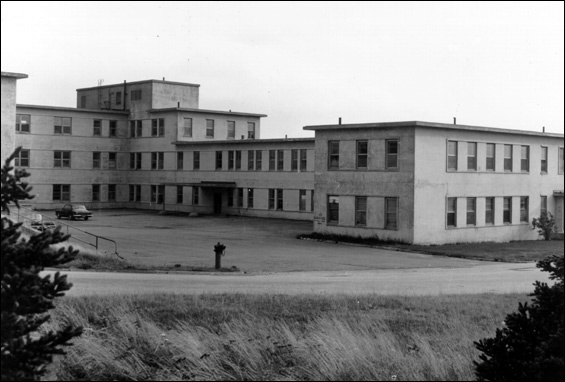 With remarkable foresight, this hospital had been built on land acquired and serviced by the Newfoundland government on the understanding that it would be turned over to the sanatorium (which was in desperate need of additional space) when hostilities ended. The second RCN hospital was also turned over to the government, and became the orthopedic wing of the General Hospital. Photographer unknown. Reproduced by the permission of the Maritime History Archive (PF-306.253), Memorial University of Newfoundland, St. John's, NL. World War II brought many changes to Newfoundland and Labrador – economic, political, cultural, and social. The area of health care was no exception. Despite the problems with housing, slums, and VD, efforts to provide medical care for soldiers, sailors and airmen attached to the military bases in Newfoundland and Labrador had long-term effects on post-war health care services. The most tangible of these were the wartime military hospitals, built for military requirements and with military budgets, which were later turned over to the government for civilian use. These facilities became vital components of post-war health care infrastructure. Much of the hospital capacity of Newfoundland in the second half of the twentieth century owes its existence to the pressures of war. There were other tangible health benefits to war as well. Improvements in transportation, especially aviation, helped reduce the isolation of much of Newfoundland and Labrador's population, which improved diets and access to medical services. More importantly, the war created an era of relative economic prosperity which helped alleviate the poverty of the 1930s. There was a discernible drop in the infant mortality rate in Newfoundland during the war years, averaging 93 deaths per 1,000 births during 1939-1944, compared with 119 deaths per 1,000 births from 1929-1934, although Newfoundland still had a higher rate than other British Commonwealth countries. Tuberculosis deaths also declined significantly during the war years, dropping below 180 deaths per 100,000 people for the first time since records were kept. The TB death rate averaged 196 for the 1930s, but 160 from 1940-1944. The Second World War may have been a devastating time in world history, but Newfoundland emerged from it economically stronger and with a better health care system.